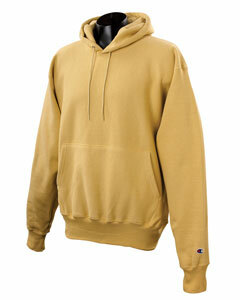 Custom embroidered hooded pullover sweatshirts by Champion, Hanes, Sport-Tek, Jerzees and Port & Company. Custom embroidered hoodies with a variety of weight such as 8 oz, 9 oz. 10 oz, 11 oz and 12 oz. options, heavy weight, super heavy weight and light weight brands. All custom embroidered with your logo included in the price. 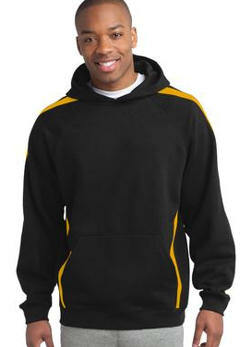 Embroidered hoodies for athletic events, team wear, school, colleges or every day casual wear. Spark up each style with your embroidered logo. Custom embroidered 996M Jerzees NuBlendT 8 oz., 50/50 Cotton/Poly Fleece Hooded Sweatshirt. 8 oz., 50/50 cotton/poly pill-resistant fleece. Double-lined hood with grommets and matching drawcord, front pouch pocket and seamless body. Spandex-reinforced 1x1 ribbed cuffs and waistband retain shape. Two-needle coverseamed armholes, neck opening, shoulders and waistband for added durability. Smooth cuff construction. Double-napped fleece provides a loftier, softer feel. Set-in drop sleeves offer a larger print area. Custom embroidered logo included. Custom embroidered G185 Gildan 7.75 oz. Heavy BlendT 50/50 Hood . 50% cotton, 50% polyester; air jet yarn creates a smooth, low-pill surface for printing; double-needle stitching throughout; 1x1 ribbed cuffs and waistband with spandex; pouch pocket; double-lined hood with drawstring . Custom embroidered logo included. Custom embroidered Port & Company® - Pullover Hooded Sweatshirt. PC90H. 9-ounce, 50/50 cotton/poly fleece. Two-ply hood, Set-in sleeves, Kangaroo pouch pocket, Dyed-to-match drawcord (Ash and Athletic Heather have white drawcords), Custom embroidery included. Tall & Youth Sizes Available! Custom embroidered hoodie by Jerzees. 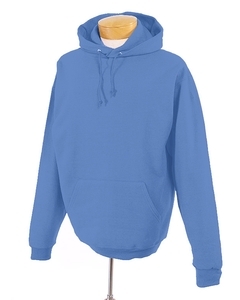 4997 Jerzees Super Sweats® 9.5 oz., 50/50 Pullover Hooded Sweatshirt. 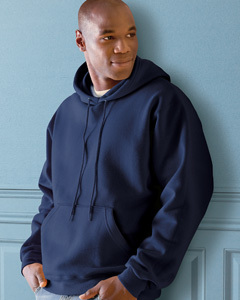 Heavyweight 50/50 hooded pullover sweatshirt with NuBlend pill-resistant fleece (Oxford is 55/45 poly/cotton), coverseamed waistband. Double-lined hood with grommets and matching drawcord. Custom embroidery included. Custom embroidered 82130 Fruit of the Loom 12 oz. SupercottonT 70/30 Pullover Hood sweatshirt . 70% cotton, 30% polyester preshrunk blend fleece; label free; ribbed cuffs and waistband with spandex; double-needle stitched collar, armholes and waistband; two-ply hood with matching tipped drawcord; pouch pocket . Custom embroidery included. 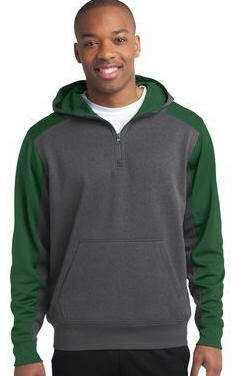 Athletic colorblocking on the shoulders and sleeves make this sweatshirt a fan or team favorite. With a comfortable cut for movement, it also resists color fading and shrinkage. 9-ounce, 65/35 cotton/poly. Jersey-taped neck. Raglan sleeves. Rib knit cuffs and waistband. Front pouch pocket. Custom Embroidery Included. Youth sizes & Tall sizes available! A throwback look with a lace up closure that can be personalized with school, team or group colored laces. (Additional laces sold separately.) 9-ounce, 65/35 ring spun combed cotton/poly fleece. White lace drawcord with grey tick stitching. Twill-taped neck. 2x2 rib knit side gussets, cuffs and hem. Set-in sleeves. Front pouch pocket. Custom embroidery included! Colorblocking on the hood, shoulders and arms provide striking contrast against the rich, heather body color of this sweat-wicking essential. Double-knit construction, a full athletic cut and enduring color means it will quickly become a go-to choice for time in the gym or hanging with friends. 7-ounce, 100% polyester. Double-needle stitching throughout. Taped neck. Reverse coil zipper. Set-in sleeves. Rib knit cuffs and hem. Front pouch pocket. Custom embroidery included. NICE heavyweight custom embroidered hoodie by Sport-Tek. 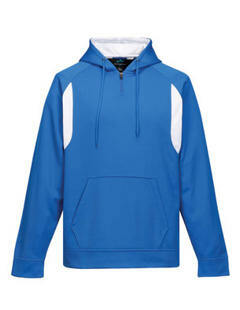 Sport-Tek® - Super Heavyweight Pullover Hooded Sweatshirt. F281. The most warmth you can get out of a sweatshirt. Our super heavyweight fleece is built for unparalleled comfort. 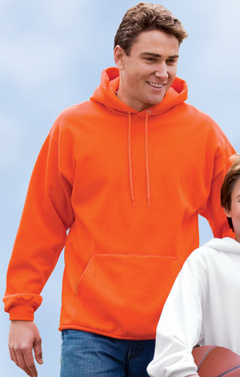 12-ounce, cross-grain 80/20 ring spun combed cotton/poly, 2x2 rib knit cuffs and hem with spandex, Rib knit side gussets, Twill taped neck, 2-ply hood with dyed-to-match lining and drawstring, Front pouch pocket, custom embroidery included. Super heavy duty custom embroidered S1051 Champion 12 oz. 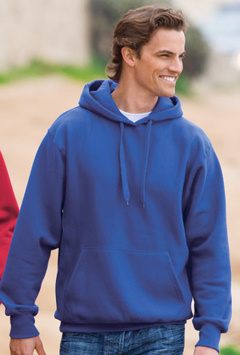 Reverse-Weave Fleece Hooded Sweatshirt . Reverse weave 12 oz. 82% cotton, 18% polyester (Silver Grey is 81% cotton, 17% polyester, 2% black rayon). Extra-heavy low-shrink fleece; drawcord hood with metal grommets; muff pocket; full athletic cut; side gussets; 3 3/4" ribbed cuffs and waistband; "C" logo. Customize with your embroidered logo included. Custom embroidered 8 oz. midweight polyester birdseye mesh performance fleece hooded sweatshirt featuring Tri-Mountain UltraCool® moisture wicking technology. Front zipper allows for easier on/off. Contrast panels provide a sporty look. 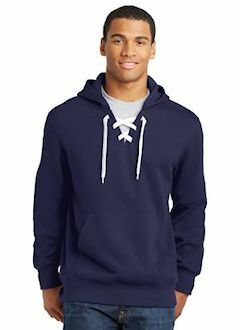 Features a lined hood with drawstring and kangaroo pocket. Customize with your embroidered logo included. Tall Sizes Available!